It’s no surprise that fear prevents many from going to the dentist. Especially when they hear the words “root canal”! But endodontics in Visalia should not be a scary thing. Endodontics is a dentistry specialty involving the inside of a tooth, such as the pulp and root canals. Dr. Michael Bodensteiner has training in both routine and complex endodontic therapies. To relieve the fear of this treatment it would be helpful to know exactly what is involved. As was mentioned, endodontics deals with the insides of the teeth, so if the pulp becomes diseased or injured, endodontic treatment is required to save the tooth. Dr. Bodensteiner will skillfully administer some anesthetic in order to make your tooth numb and your procedure comfortable. He will then carefully make a small hole in the biting surface of your tooth and clean it out to get rid of the infected material. Then he will sterilize the canals, fill it up with a rubber-like substance and put a filling on top to cover the hole. There may be some slight swelling or pain for a few days, which is totally normal. But the throbbing you experienced before will be gone! 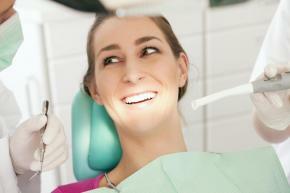 A good place to start overcoming your fears is with a dentist who listens to them. Come and make an appointment for endodontics in Visalia, and with time, and a dentist you trust, your fears will disappear!